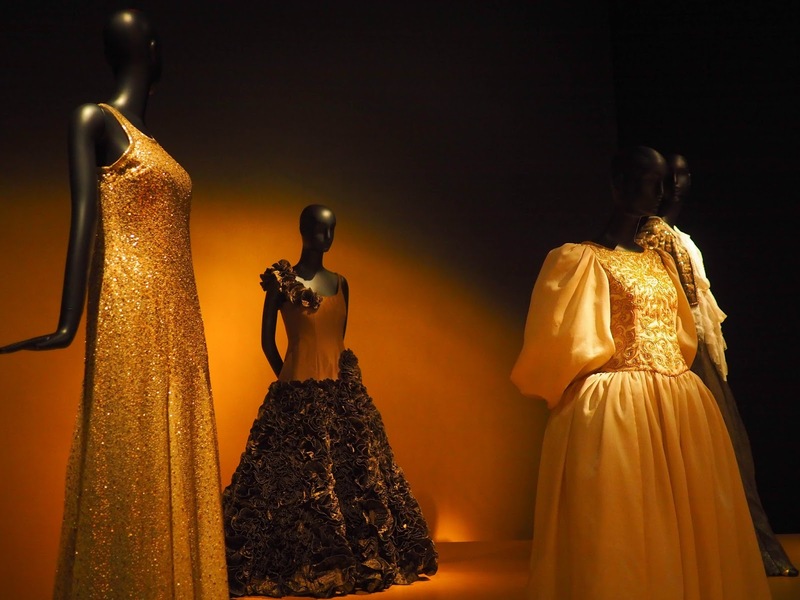 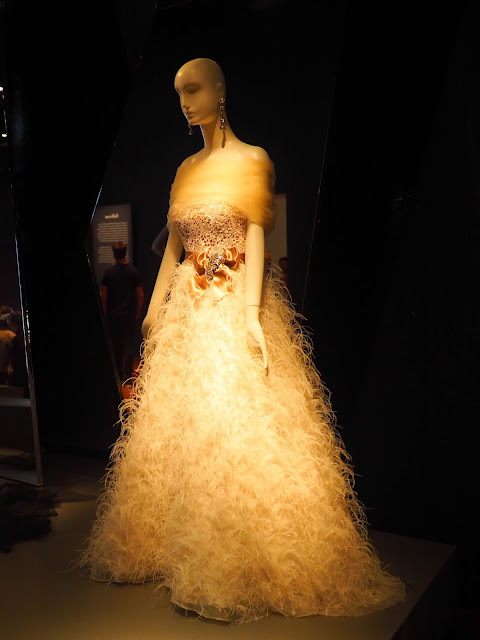 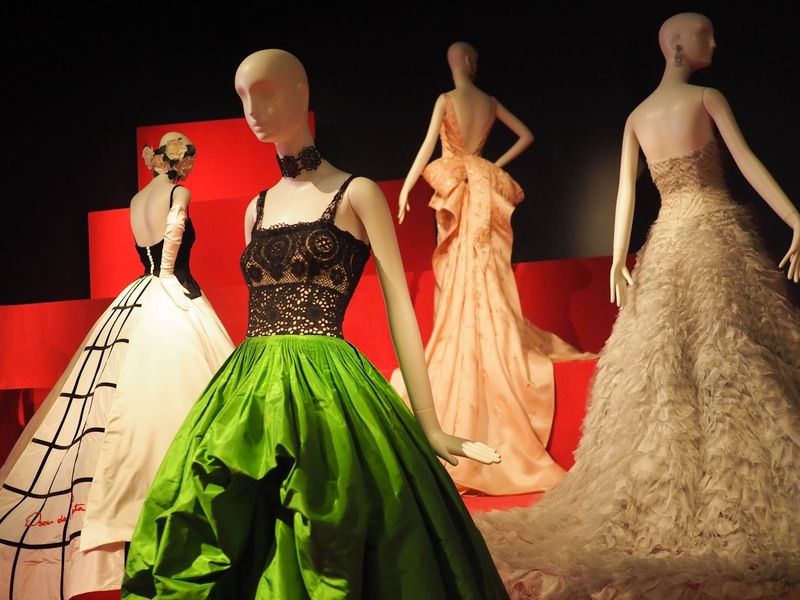 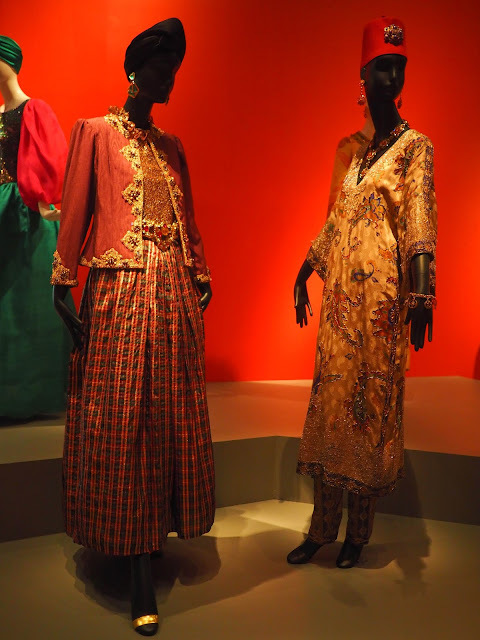 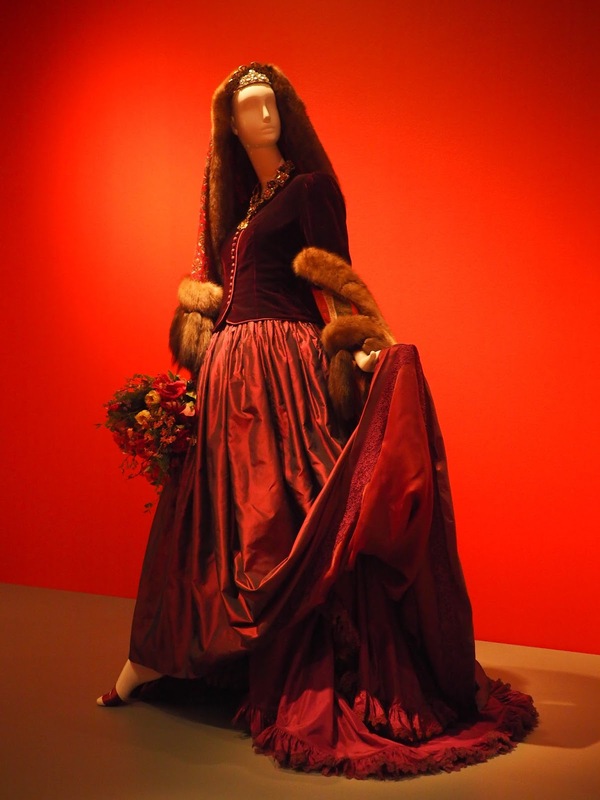 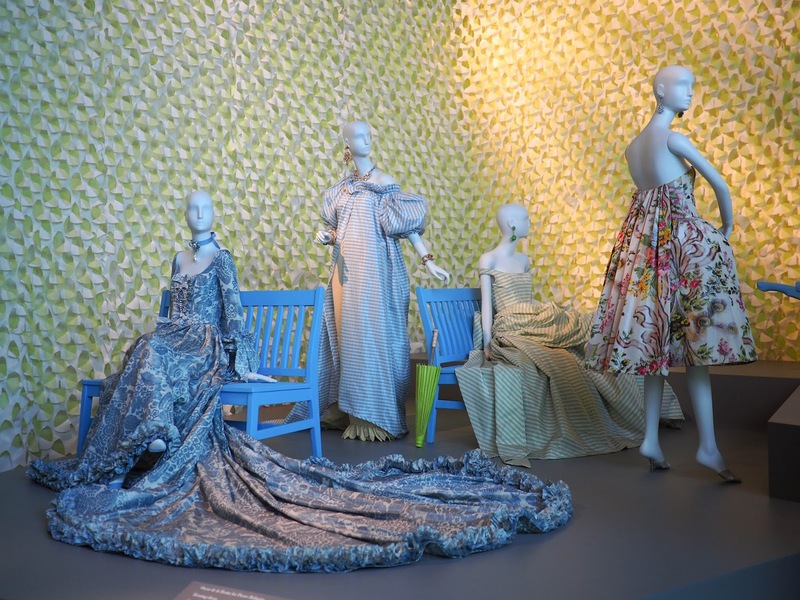 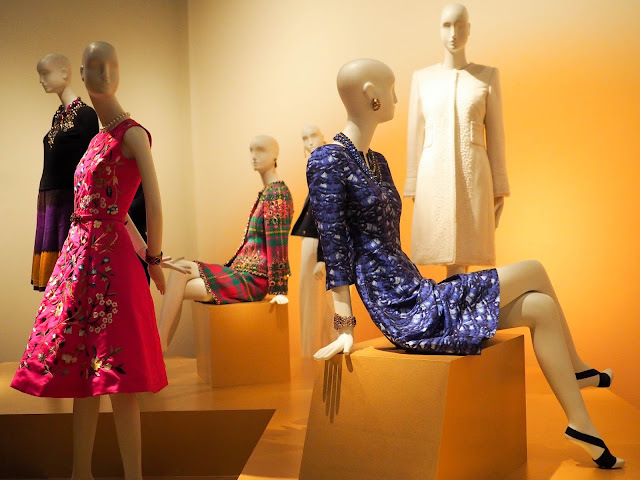 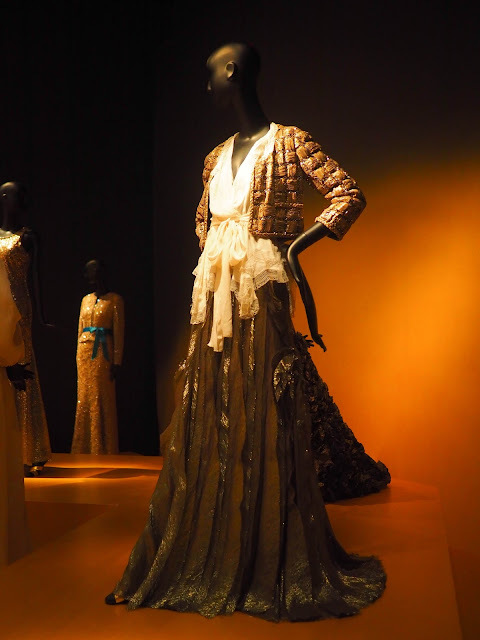 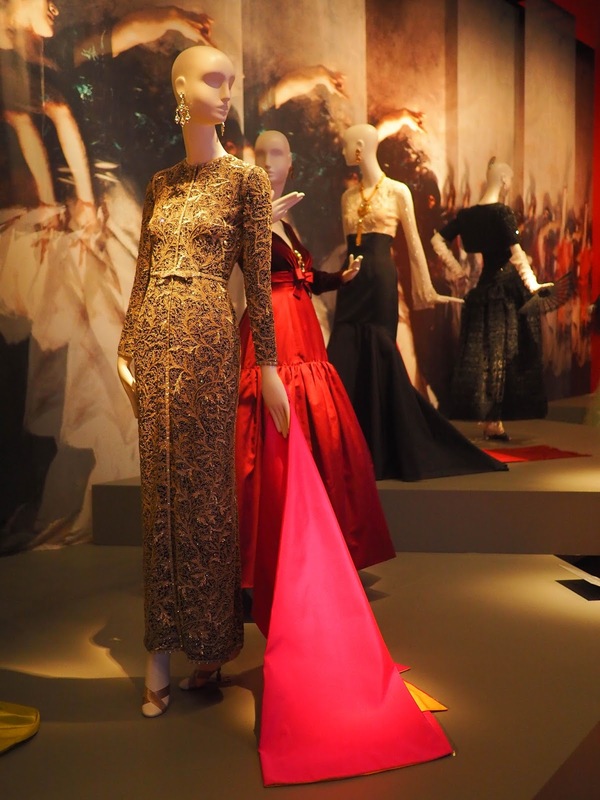 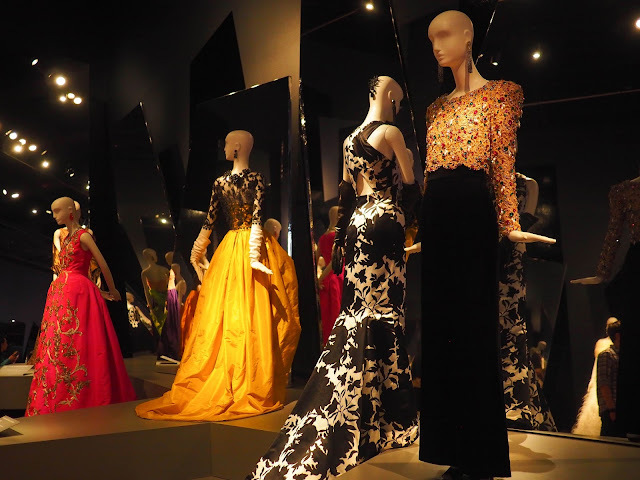 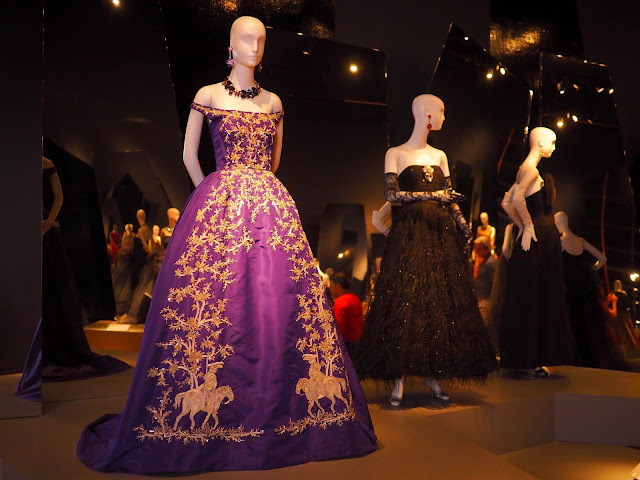 Last Sunday Mathilde and I headed to the de Young Museum in San Francisco's Golden Gate Park to check out the current exhibition, Oscar de la Renta: The Retrospective. What an exhibition! 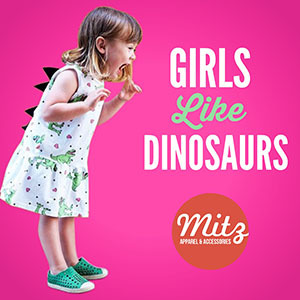 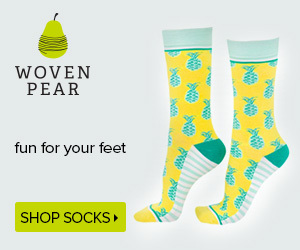 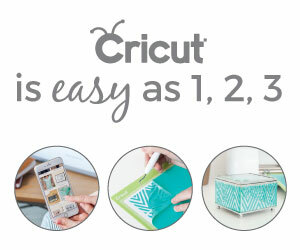 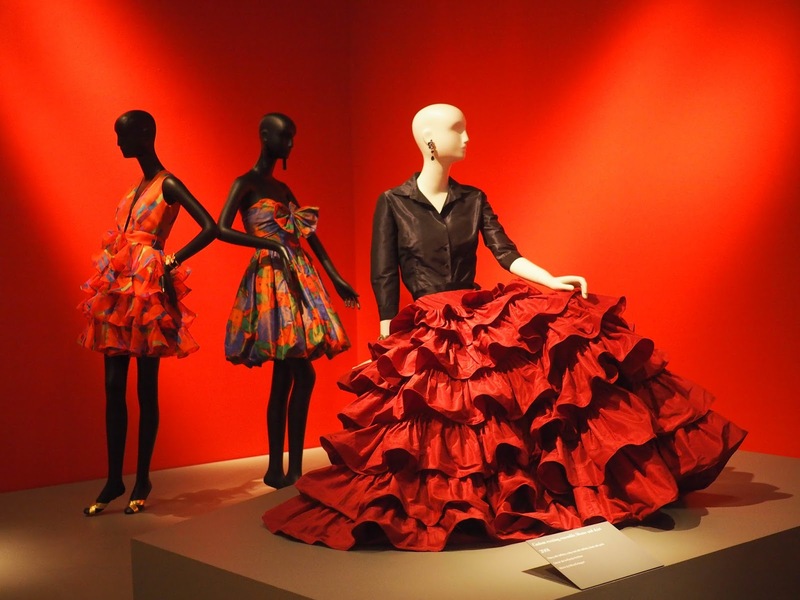 If you're at all interested in fashion design (or if you just like looking at pretty dresses!) get yourself to the de Young to see this amazing collection of couture and ready to wear spanning five decades. 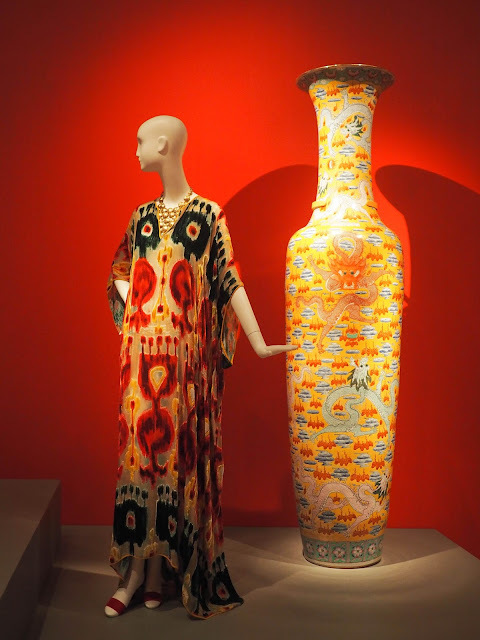 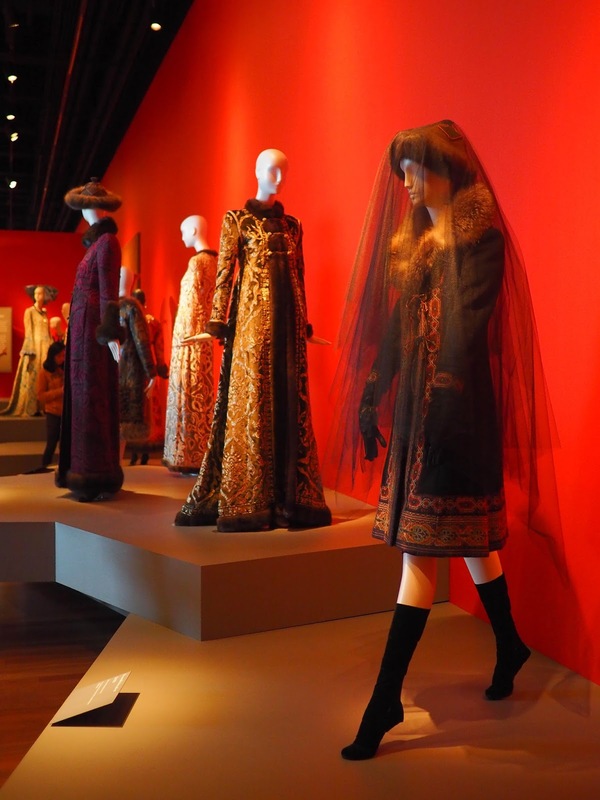 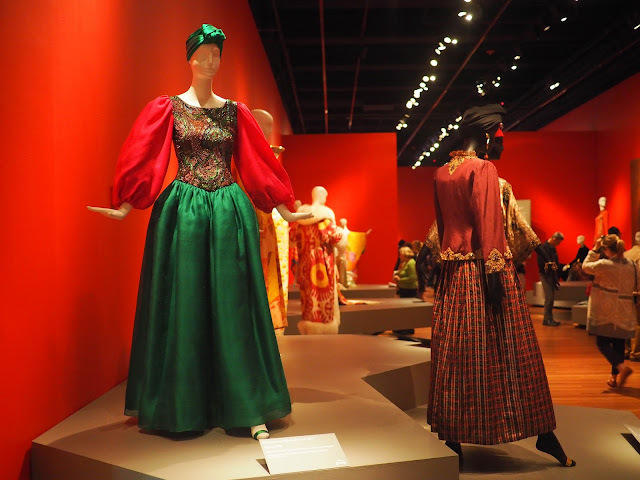 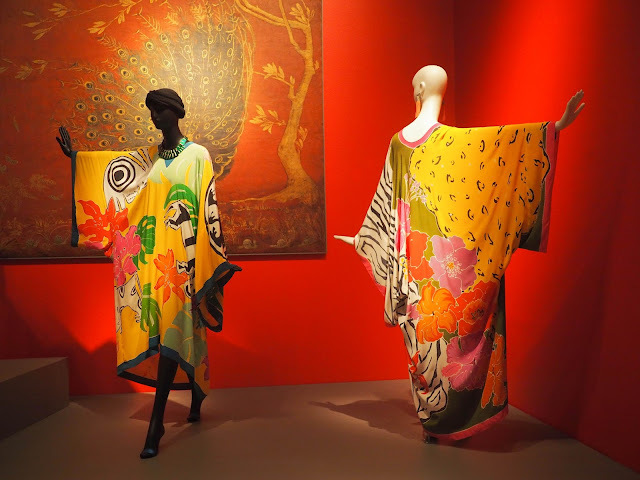 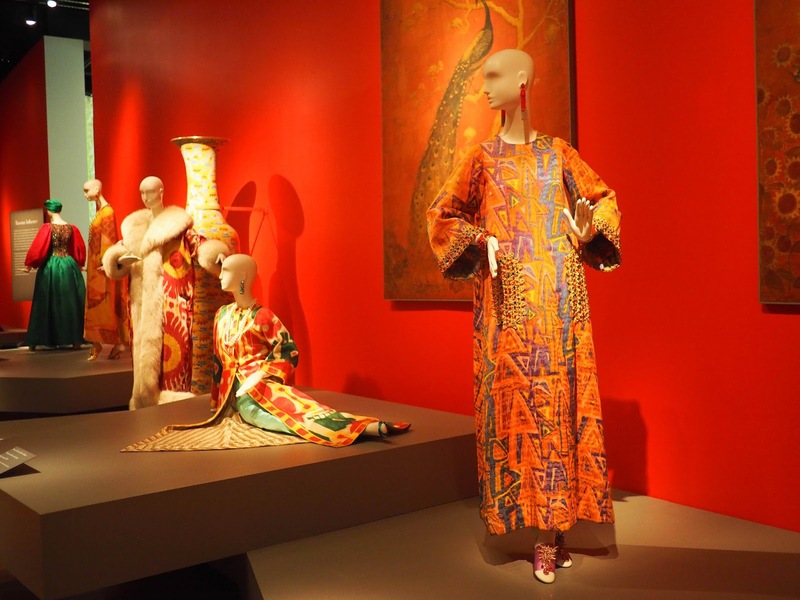 The exhibition features more than 130 outfits and is organized into several thematic sections: early work; Spanish, Eastern, Russian and garden influences; day wear and evening wear; and ballgowns and red carpet ensembles. 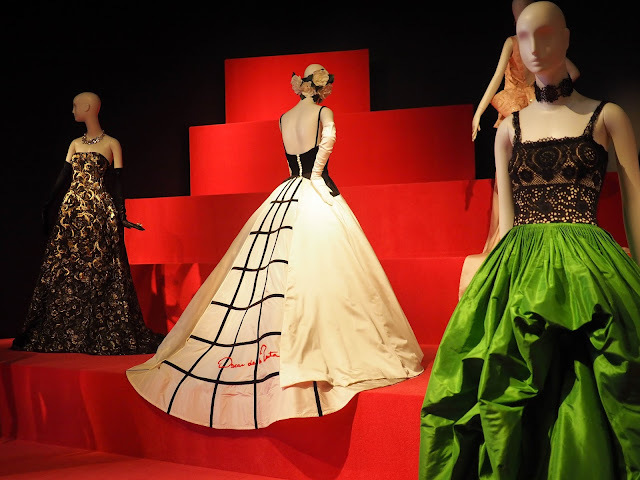 That last section proved to be incredibly popular with visitors flocking to see the red carpet looks they've seen on celebrities, including the black and white dress in the top photo which was famously worn by Sarah Jessica Parker at the 2014 Met Gala. Oscar de la Renta was born in Dominican Republic in 1932. He moved to Spain at age 18 to study painting in Madrid, and during this time he drew clothes for newspapers and fashion houses to make money. 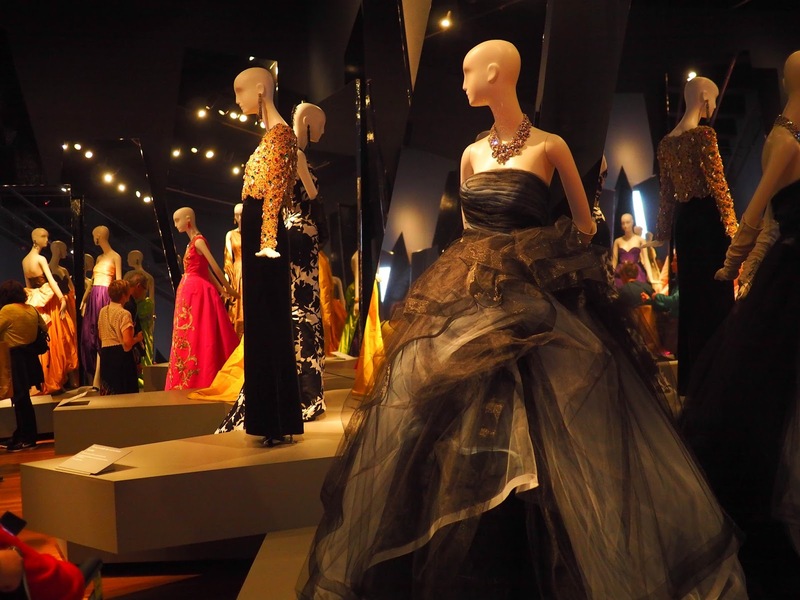 From these beginnings an amazing career in fashion was born. 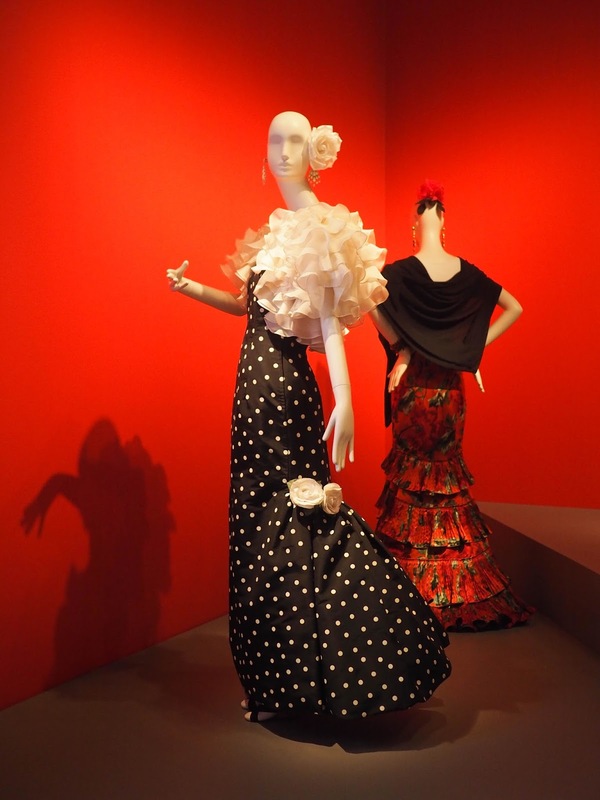 He apprenticed under couturier Cristobal Balenciaga in Spain, then later moved to Paris to work for Lanvin. 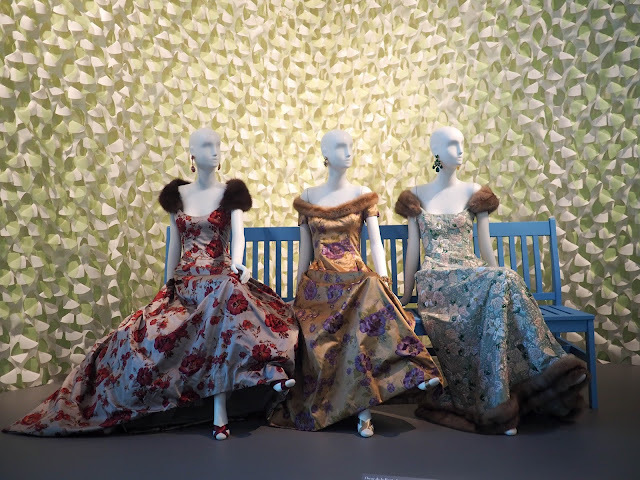 Eager to move into the world of ready to wear, de la Renta moved to the USA in 1963 where he worked for Elizabeth Arden in New York, before taking over American fashion house Jane Derby in 1965. The Jane Derby fashion house was later renamed Oscar de la Renta in 1966. 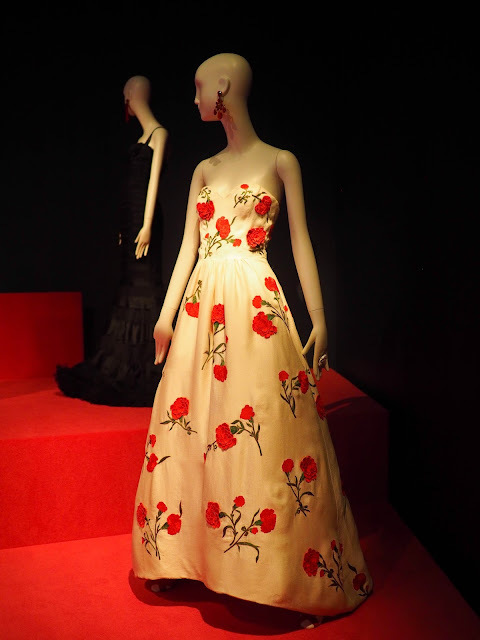 In 1969 de la Renta became an American citizen. In 1973 Oscar represented America in the "Battle of Versailles" with designs including the dresses below. 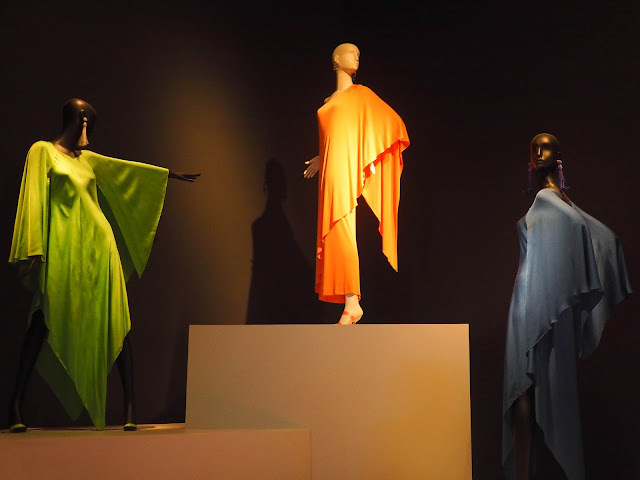 This event in which 5 American designers competed against 5 European designers, showed the world that American designers were as much at the forefront of fashion as their European counterparts, and a force to be reckoned with. 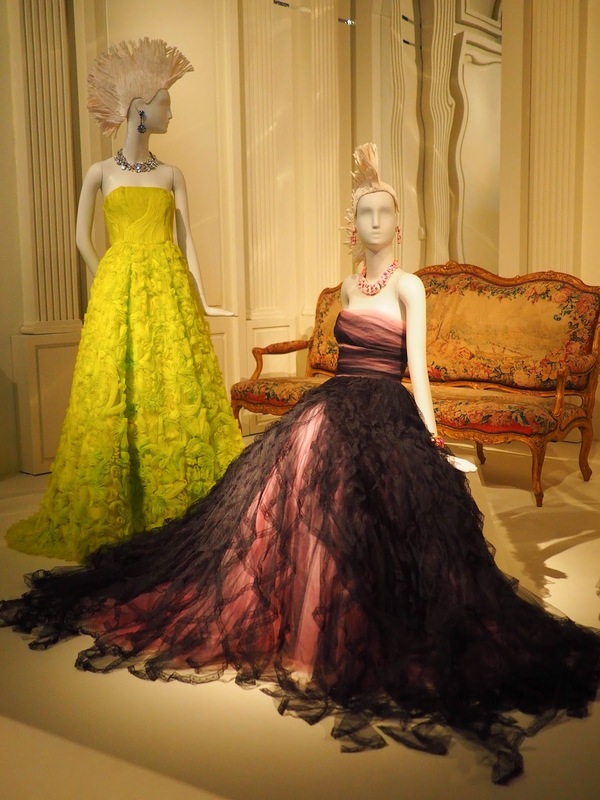 When Oscar de la Renta passed away in 2014, he was one of the fashion world's biggest names, and rightly so. 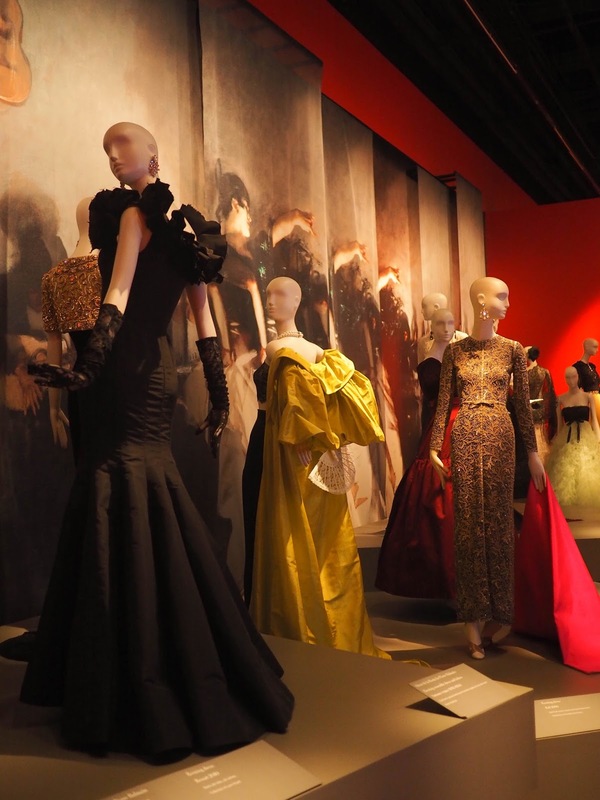 His body of work truly is amazing and this exhibition showcases some of his finest moments. Throughout the exhibition de la Renta's influences are clearly on display. 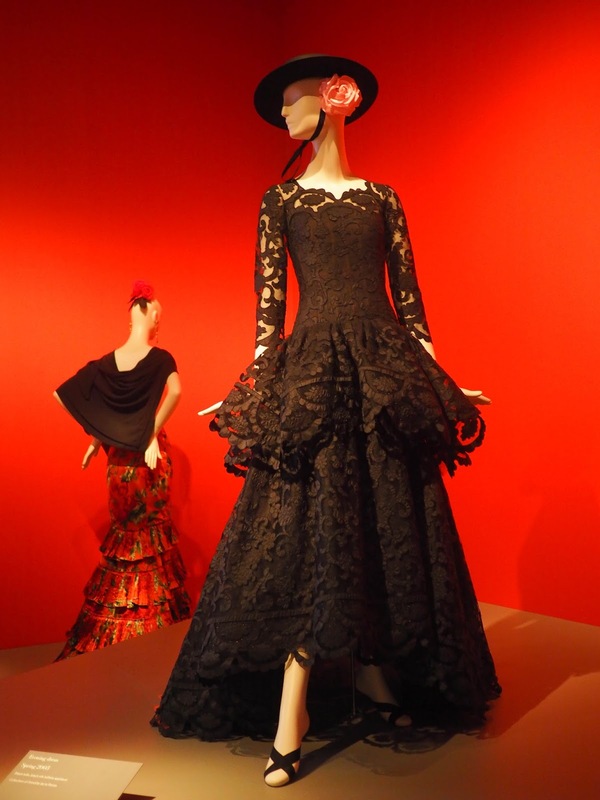 Spanish inspired dresses are a nod to his time in Spain where his career in fashion began. 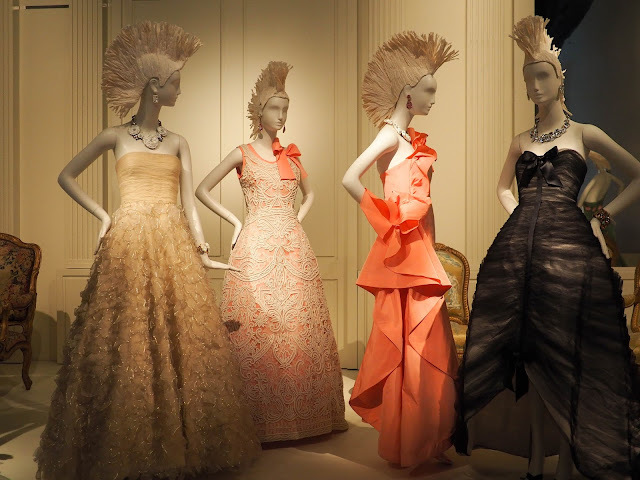 Like most of de la Renta's designs, the dresses are bold yet feminine. 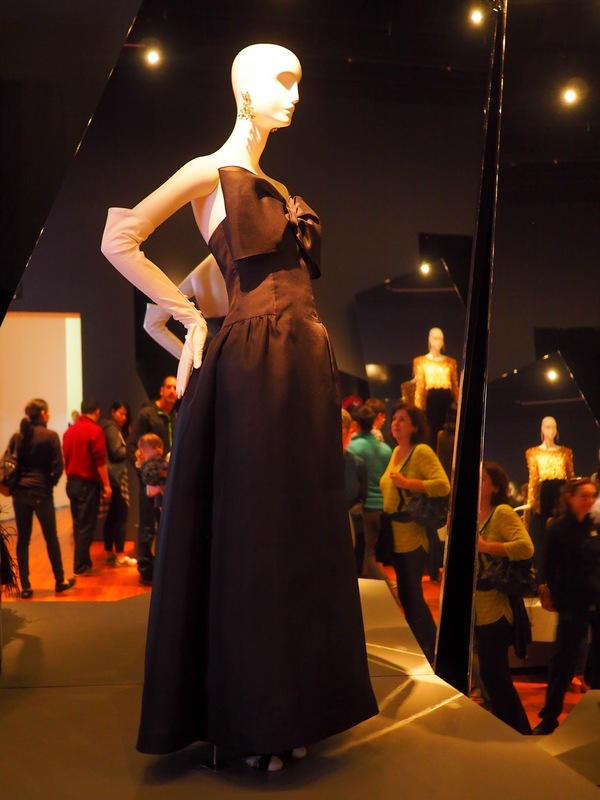 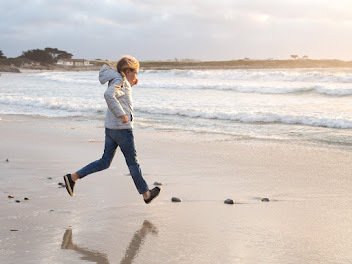 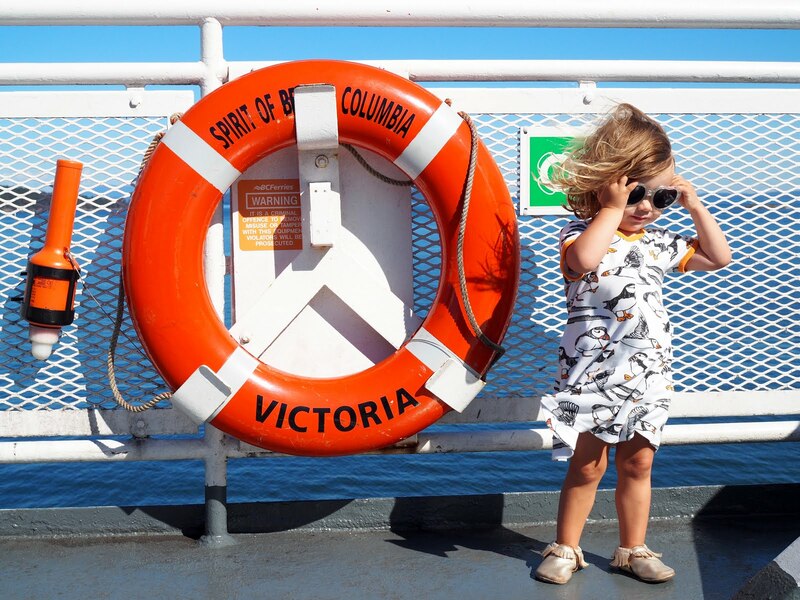 Elegant yet playful. Simply stunning. 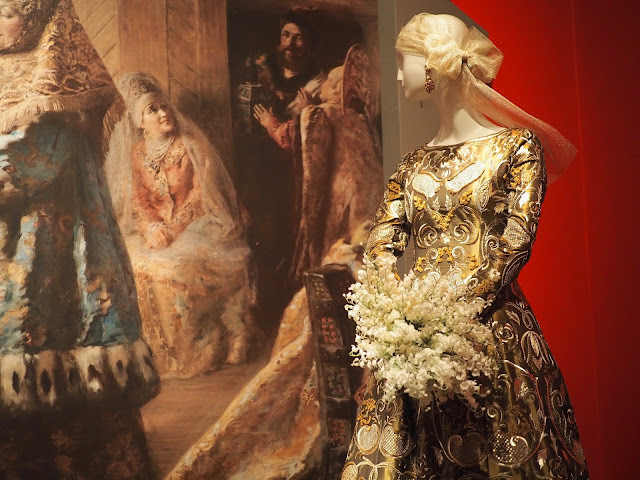 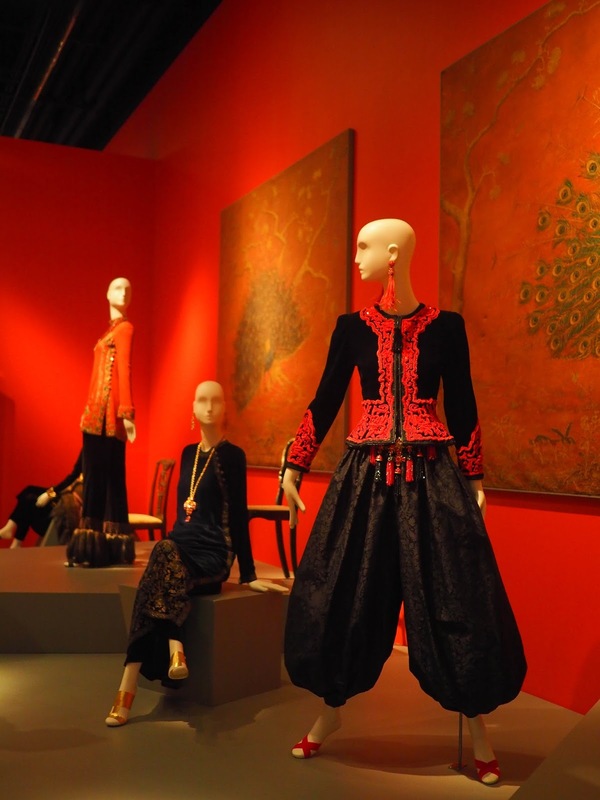 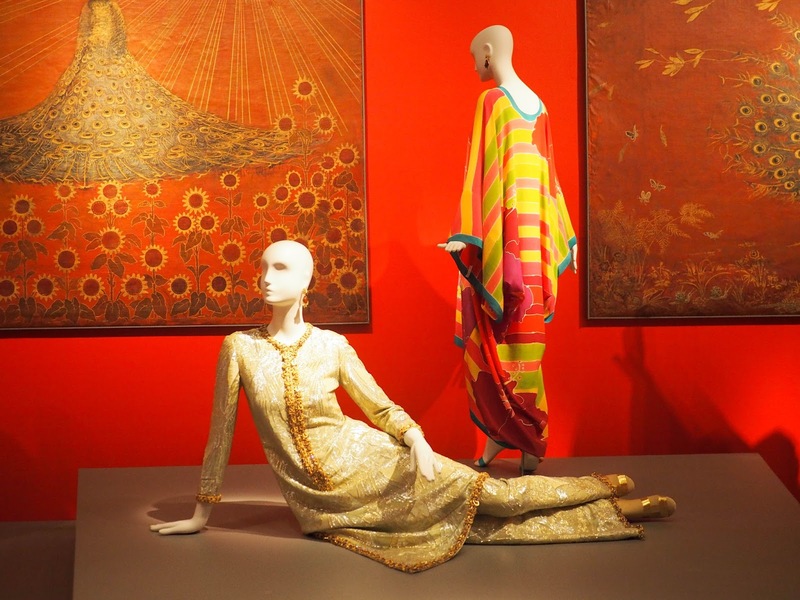 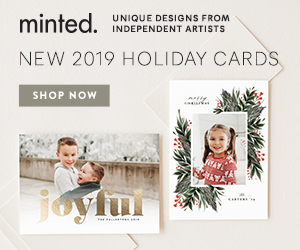 The Eastern and Russian section features stunning watercolor caftans, fur accented outfits, amazing bead work, the puffiest harem pants, and intricate wedding dresses. 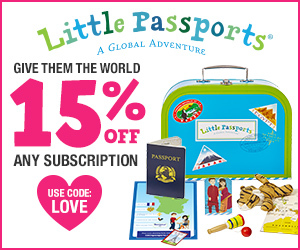 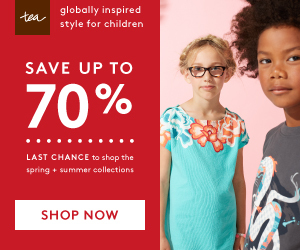 Like the Spanish inspired designs, these outfits are bold in color and highly detailed. 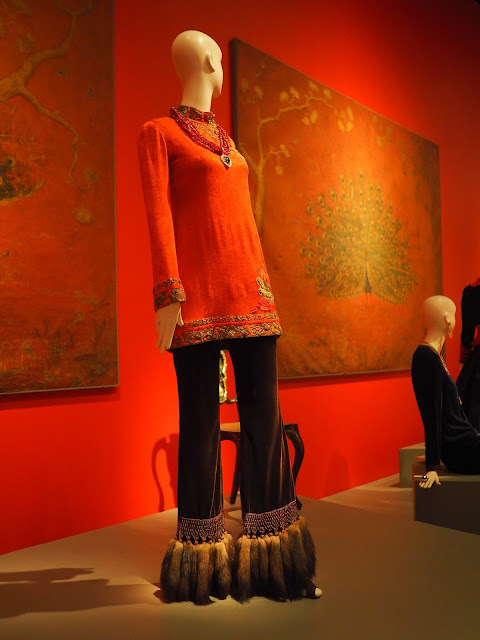 This is the only section of the exhibition that features pants, as opposed to just dresses. 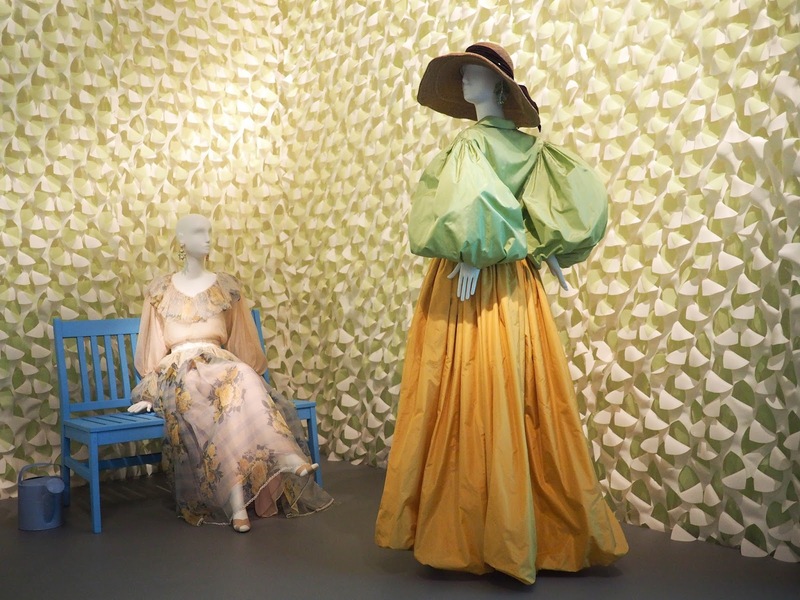 From the bold colors of the Eastern and Russian section we entered the cool, green walled garden section where pastels, florals and delicate designs rule. Long flowing dresses, tulle, taffeta, puffy sleeves... All very pretty. 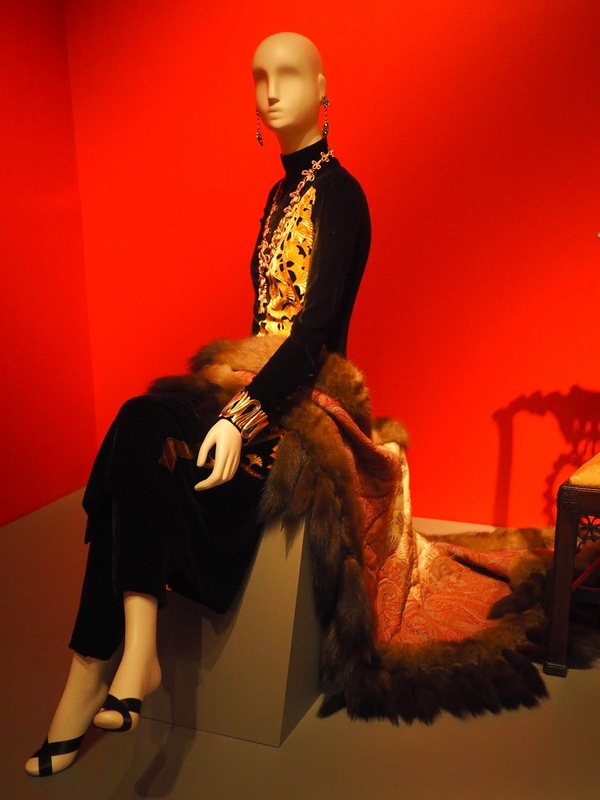 Mathilde liked this particular part of the exhibition as unlike the other rooms, it wasn't dark! 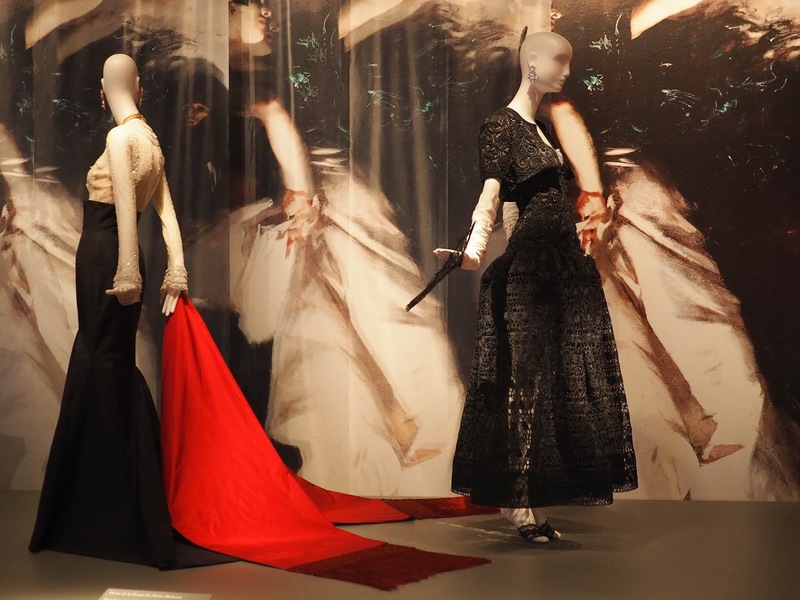 Between the garden section and the ballgowns and red carpet section, mohawked mannequins n evening gowns recreate a photo spread from Vogue magazine (December 2010). 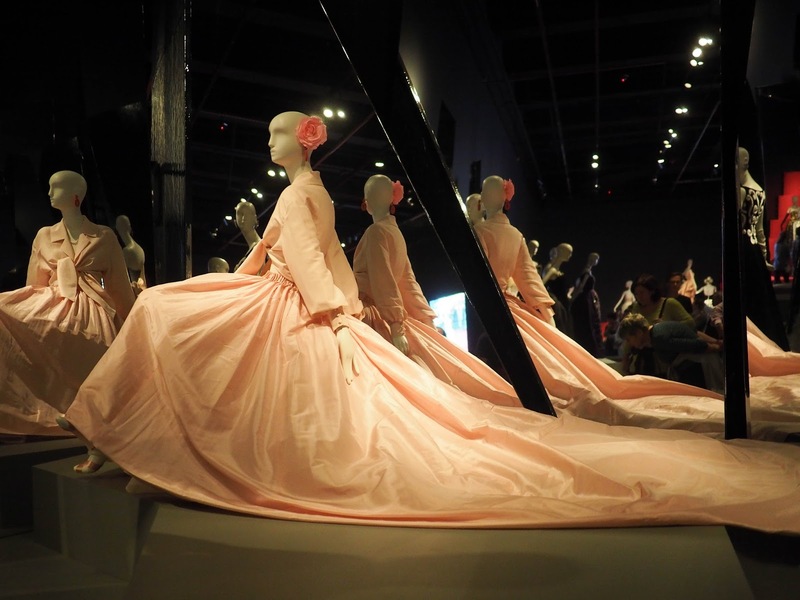 The final section of the exhibition is a mirrored room full of ball gown and red carpet looks. 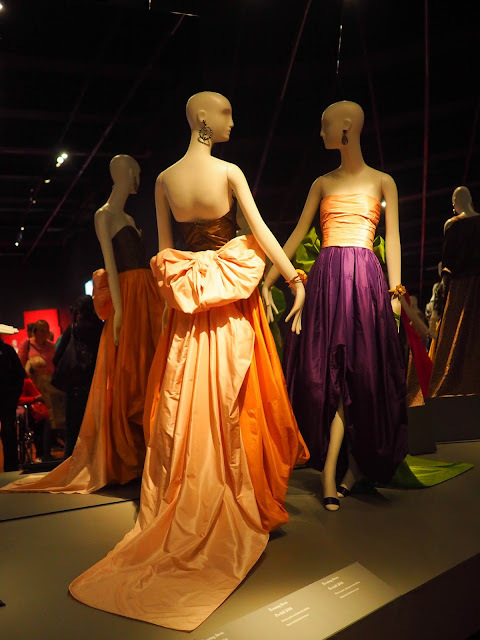 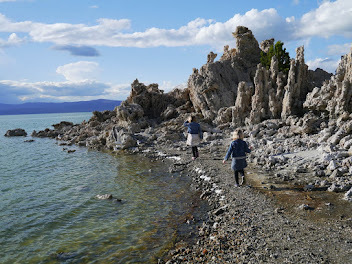 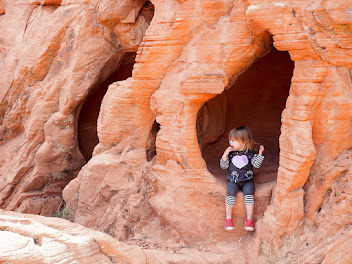 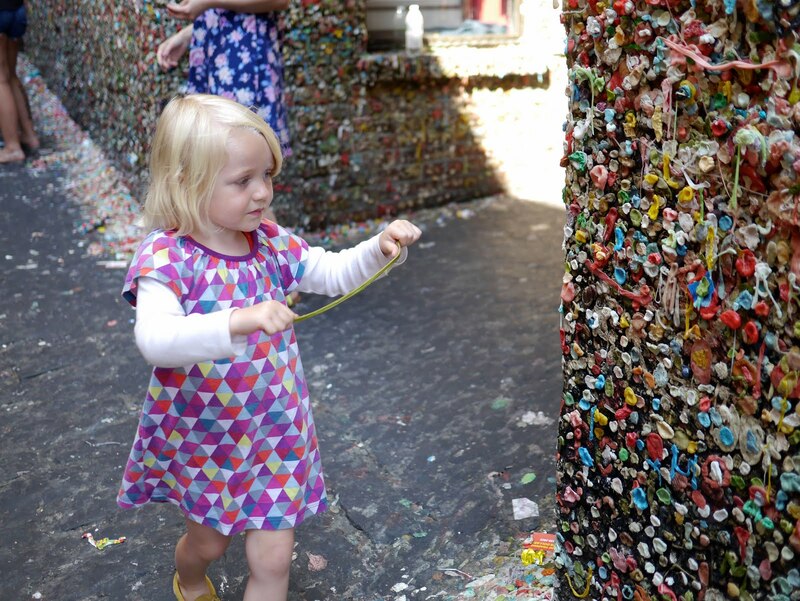 With mirrors strategically placed, visitors are able to view both the back and front of each dress. 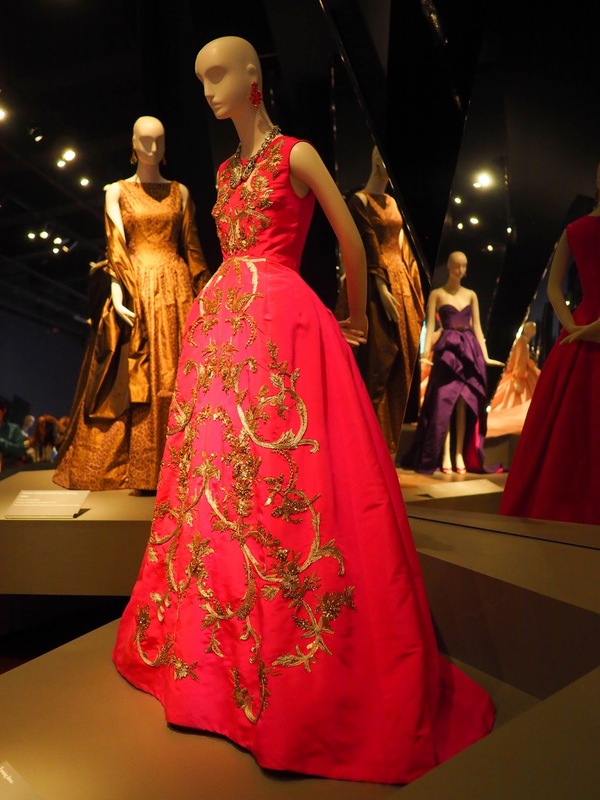 With such intricate detail on many of the dresses it's fantastic to be able to see both sides. 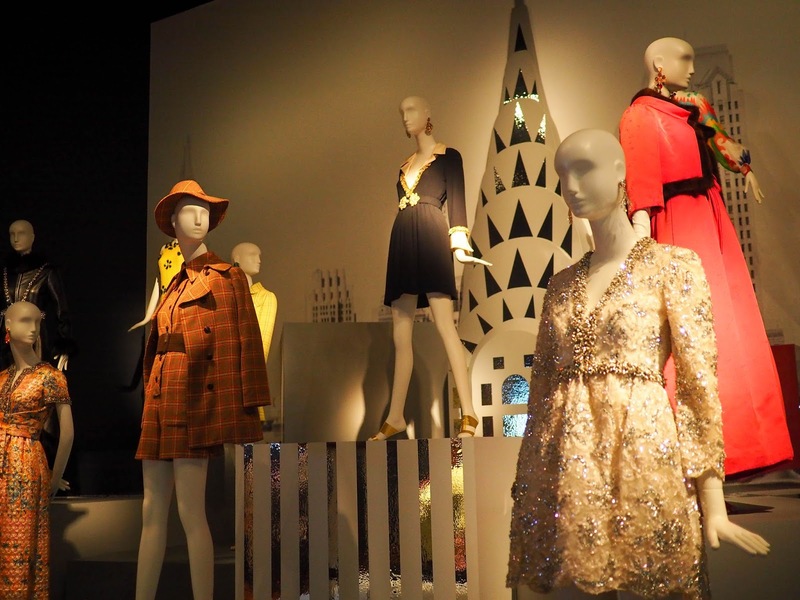 The very last display before the gift shop features memorable red carpet looks including dresses worn by Sarah Jessica Parker, Taylor Swift, Rhianna, Nikki Minaj, Amy Adams and Jessica Chastain. 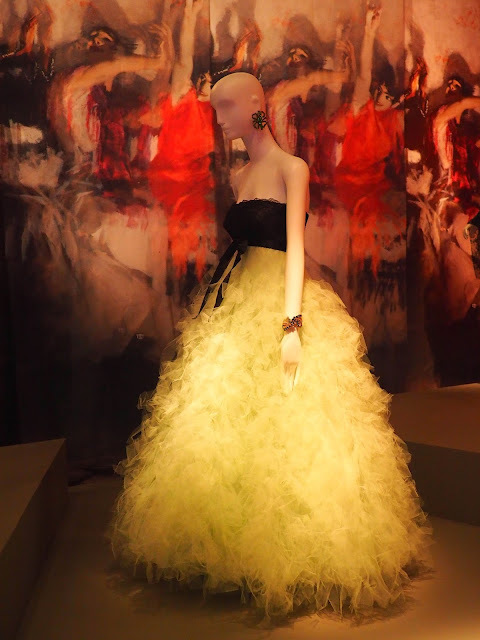 Oscar de la Renta: The Retrospective runs through Monday May 30th. 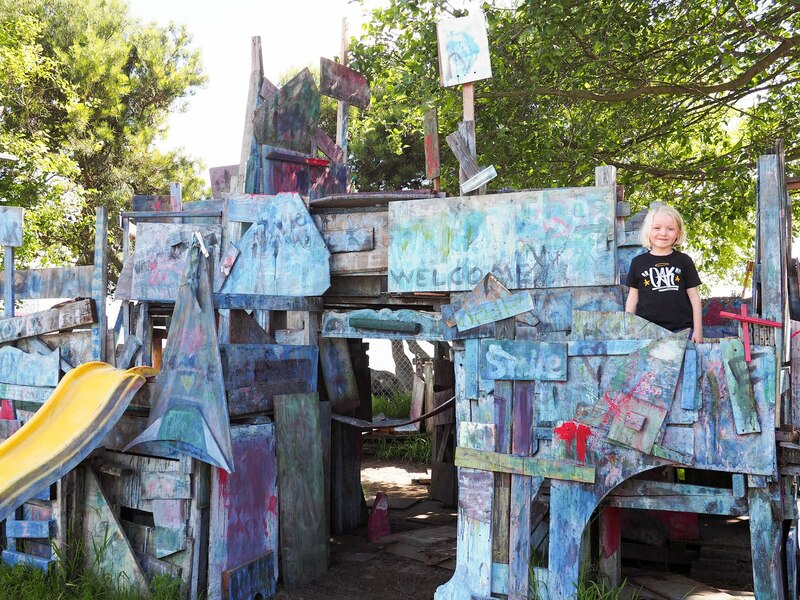 There's only just over a week left to see this amazing exhibition so hop to it! 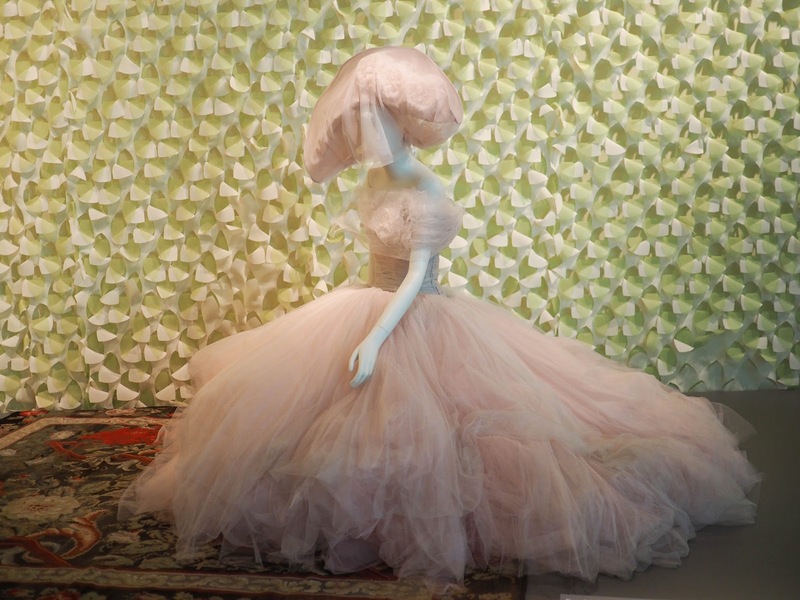 For more information, exhibition hours and to purchase tickets purchase visit the de Young website here.